The Honors Symposium is one of the longest standing traditions in the Burnett Honors College. This one-credit hour required service-learning course is intended to introduce new students to the University through an integrative curriculum that challenges them to think critically about their community. Each week, some of the best faculty members at UCF present an informative lecture on the Symposium theme, the Evolution of Community. 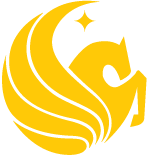 Students also participate in an exciting service-learning experience through getting involved with a Registered Student Organization or Volunteer UCF. By combining public service with an academic course, students have the unique opportunity to contextualize the knowledge acquired within the classroom with their individual service-learning experiences. Through class discussions, readings, and reflection, students will also be able to connect the relevance of service-learning work to the course objectives and their broader academic field of study. Under the direction of a Symposium Team Leader, students have the opportunity to discuss their thoughts and observations collaboratively with their group. This group setting helps to further provide incoming Honors freshman with a sense of community within a larger University, offering them the chance to communicate effectively and build social networks.